Y ( named wye  /waɪ/, plural wyes)  is the 25th and penultimate letter in the modern English alphabet and the ISO basic Latin alphabet. In the English writing system, it sometimes represents a vowel and sometimes a consonant. In Latin, Y was named I graeca ("Greek I"), since the classical Greek sound /y/, similar to modern German ü or French u, was not a native sound for Latin speakers, and the letter was initially only used to spell foreign words. This history has led to the standard modern names of the letter in Romance languages – i grego in Galician, i grega in Catalan, i grec in French and Romanian, i greca in Italian – all meaning "Greek I". The names igrek in Polish and i gờ-rét in Vietnamese are both phonetic borrowings of the French name. In Dutch, both Griekse ij and i-grec are used. In Spanish, Y is also called i griega; however, in the twentieth century, the shorter name ye was proposed and was officially recognized as its name in 2010 by the Real Academia Española, although its original name is still accepted. The original Greek name υ ψιλόν ( upsilon) has also been adapted into several modern languages: in German, for example, it is called Ypsilon, in Icelandic it is ufsilon i, and in Italian the name is ipsilon or i greca. In Portuguese, both names are used (ípsilon and i grego). In Faroese, the letter is simply called seinna i ("later i") because of its later place in the alphabet. Old English borrowed Latin Y to write the native Old English sound /y/ (previously written with the rune yr ᚣ). The name of the letter may be related to 'ui' (or 'vi') in various medieval languages;[ citation needed] in Middle English it was 'wi' /wiː/,[ citation needed] which through the Great Vowel Shift became the Modern English 'wy' /waɪ/. The Roman Emperor Claudius proposed introducing a new letter into the Latin alphabet to transcribe the so-called sonus medius (a short vowel before labial consonants),  which in inscriptions was sometimes used for Greek upsilon instead. In Dutch, it usually represents /i/. It may sometimes be left out of the Dutch alphabet and replaced with the ⟨ ij⟩ digraph. 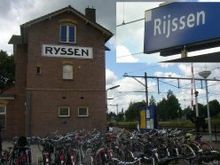 In addition, ⟨y⟩ and ⟨ÿ⟩ are occasionally used instead of Dutch ⟨IJ⟩ and ⟨ij⟩, albeit very rarely. In German orthography, the pronunciation /yː/ has taken hold since the 19th century in classical loanwords – for instance in words like typisch /ˈtyːpɪʃ/ 'typical', Hyäne, Hysterie, mysteriös, Syndrom, System, Typ. It is also used for the sound /j/ in loanwords, such as Yacht (variation spelling: Jacht), Yak, Yeti; however, e.g. yo-yo is spelled "Jo-Jo" in German, and yoghurt/yogurt/yoghourt "Jog(h)urt" [mostly spelled with h[ citation needed]]). The letter ⟨y⟩ is also used in many geographical names, e.g. Bayern Bavaria, Ägypten Egypt, Libyen Libya, Paraguay, Syrien Syria, Uruguay, Zypern Cyprus (but: Jemen Yemen, Jugoslawien Yugoslavia). Especially in German names, the pronunciations /iː/ or /ɪ/ occur as well – for instance in the name Meyer, where it serves as a variant of ⟨i⟩, cf. Meier, another common spelling of the name. In German the y is preserved in the plural form of some loanwords such as Babys babies and Partys parties, celebrations. In Spanish, ⟨y⟩ was used as a word-initial form of ⟨i⟩ that was more visible. (German has used ⟨j⟩ in a similar way.) Hence, el yugo y las flechas was a symbol sharing the initials of Isabella I of Castille (Ysabel) and Ferdinand II of Aragon. This spelling was reformed by the Royal Spanish Academy and currently is only found in proper names spelled archaically, such as Ybarra or CYII, the symbol of the Canal de Isabel II. Appearing alone as a word, the letter ⟨y⟩ is a grammatical conjunction with the meaning " and" in Spanish and is pronounced /i/. As a consonant, ⟨y⟩ represents [ ʝ] in Spanish. The letter is called i/y griega, literally meaning "Greek I", after the Greek letter ypsilon, or ye. In Portuguese, ⟨y⟩ (called ípsilon in Brazil, and either ípsilon or i grego in Portugal) was, together with ⟨k⟩ and ⟨w⟩, recently reintroduced as the 25th letter, and 19th consonant, of the Portuguese alphabet, in consequence of the Portuguese Language Orthographic Agreement of 1990. It is mostly used in loanwords from English, Japanese and Spanish. Loanwords in general, primarily gallicisms in both varieties, are more common in Brazilian Portuguese than in European Portuguese. It was always common for Brazilians to stylize Tupi-influenced names of their children with the letter (which is present in most Romanizations of Old Tupi) e.g. Guaracy, Jandyra, Mayara – though placenames and loanwords derived from indigenous origins had the letter substituted for ⟨ i⟩ over time e.g. Nictheroy became Niterói. Usual pronunciations are / i/, [ j], [ ɪ] and / ɨ/ (the two latter ones are inexistent in European and Brazilian Portuguese varieties respectively, being both substituted by / i/ in other dialects). The letters ⟨ i⟩ and ⟨y⟩ are regarded as phonemically not dissimilar, though the first corresponds to a vowel and the latter to a consonant, and both can correspond to a semivowel depending on its place in a word. In Guaraní, it represents the vowel [ ɨ]. In Polish, it represents the vowel [ ɘ] (or, according to some descriptions, [ ɨ̞]), which is clearly different from [ i], e.g. my (we) and mi (me). No native Polish word begins with ⟨y⟩; very few foreign words keep ⟨y⟩ at the beginning, e.g. Yeti (pronounced [ˈjɛtʲi]). In Welsh, it is usually pronounced [ ə] in non-final syllables and [ ɨ] or [ i] (depending on the accent) in final syllables. In the Standard Written Form of the Cornish Language, it represents the [ ɪ] and [ ɪː] of Revived Middle Cornish and the [ ɪ] and [ iː] of Revived Late Cornish. It can also represent Tudor and Revived Late Cornish [ ɛ] and [ eː] and consequently be replaced in writing with ⟨e⟩. It is also used in forming a number of diphthongs. As a consonant it represents [ j]. In Finnish and Albanian, ⟨y⟩ is always pronounced [ y]. When used as a vowel in Vietnamese, the letter ⟨y⟩ represents the sound /i/; when it is a monophthong, it is functionally equivalent to the Vietnamese letter ⟨i⟩. Thus, Mỹ Lai does not rhyme, but mỳ Lee does. [ clarification needed]<?----> There have been efforts to replace all such uses with ⟨y⟩ altogether, but they have been largely unsuccessful. As a consonant, it represents the palatal approximant. The capital letter ⟨Y⟩ is also used in Vietnamese as a given name. In Aymara, Indonesian, Turkish, Quechua and the romanization of Japanese, Y is always a palatal consonant, denoting [ j], as in English. In Turkmen, ⟨y⟩ represents [ ɯ].